"I want to encode my videos to HEVC. Anybody know a program that supports HEVC encoding on Windows PC? I tried HandBrake, but it is painfully slow. My computer is equipped with NVIDIA GeForce GTX 1050. Can I make use of it to accelerate HEVC encoding?" HEVC (High Efficiency Video Coding), also known as H.265, is the successor to the popular H.264/AVC. Comparing H.265 with H.264, we find that using the new video compression standard can save more space and use less bandwidth because it offers more data compression, roughly doubled, without degradation in quality. Therefore, it is gradually accepted by more and more programs and devices, iPhone X and iPhone 8, for example. And with that in mind, some people begin searching for video encoder supporting HEVC. Which Video Encoder Is Compatible with HEVC? HandBrake, a free open source video transcoder, added the support for HEVC encoding with the release of version 0.10.0 in 2014. It is available through H.265 (x265) located in Video Codec option of Video tab. But the bad news is that encoding to H.265 is a more complex process requiring many times longer than encoding to H.264 and other codecs, especially on HandBrake which doesn't support NVIDIA NVENC/CUDA GPU acceleration and can't support Intel QSV very well according to some users' feedback. Moreover, HEVC encoding is a CPU-intensive operation demanding for up to 10 times the computer power to encode at the same speed as H.264, which makes more difficult for HandBrake which always uses CPU at over 90% and often close to 100% even when encoding H.264. So, it is no surprise that HandBrake encodes HEVC at intolerably slow speed. Well, is there a HEVC encoder that supports NVIDIA NVENC/CUDA hardware acceleration technologies, thus we can vastly shrink encoding time? 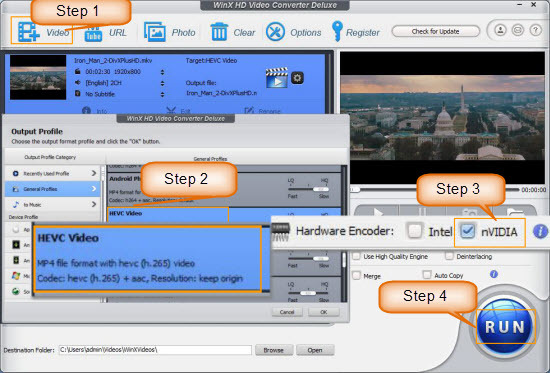 Read on and you'll get the best and fastest NVIDIA HEVC encoder - WinX HD Video Converter Deluxe. WinX HD Video Converter Deluxe is the first program that perfectly supports hardware-accelerated video encoding, decoding and also calculating. Before the end of 2015, WinX HD Video Converter Deluxe got a breakthrough update adding the support for Intel QSV and NVIDIA NVENC/CUDA to boost video transcoding speed. In this way, this tool is able to make full use of CPU and GPU. When working on computers armed with both QSV-allowed Intel processor (2-6th generation) and CUDA/NVENC-enabled NVIDIA GPU, video processing speed can be advanced 16X faster. However, that version only supports H.264 encoding. H.265 video encoding, decoding and H.264 decoding were not supported until it was updated to V5.11.0 built on November 13, 2017. So, make sure you're working on WinX HD Video Converter Deluxe V5.11.0 and later to fast encode HEVC with NVIDIA NVENC/CUDA GPU acceleration. If you don't have this NVIDIA HEVC encoder or have an older version, click the download button here to get the latest version. It is fully compatible with Windows 10, 8.1/8, 7 and lower. Currently, its Mac version doesn't support NVIDIA NVENC/CUDA for H.265 encoding, but offers Intel QSV. After completing download and installation, just launch it and begin HEVC encoding without losing quality. Step 1. Click +Video button at the top left corner of main screen to load source videos. Input one or more files? It totally depends on you. You're allowed to convert the following file formats to HEVC. Step 2. Choose an output profile using HEVC (H.265) codec. To get a resulting file in MP4 container format with HEVC (H.265) codec, go to General Profiles -> HEVC Video. If you prefer MKV file format, scroll down to PC General Video -> HEVC Video. Related: MKV vs MP4 - What're Differences Between MKV and MP4? Step 3. Check nVIDIA hardware encoder under the preview window of main UI. Additionally, you can also enable Intel. Step 4. Hit RUN, and you will see this NVIDIA H.265 encoder begins working. The progress bar will show you FPS (up to 500+ FPS in my testing), estimated remaining encoding time and other information. H.265 video encoding will be processed at lightning speed thanks to NVIDIA NVENC/CUDA and previous inbuilt techniques like MMX-SSE, Hyper-threading and AMD 3DNow!. Which NVIDIA GPUs Do Support HEVC Encoding? In the table below, we list the NVIDIA Quadro and Tesla products with Maxwell, Pascal and Volta generation GPUs that support NVENC HEVC encoding. How can I find out which GPU is in my computer? • Right-click on desktop. If you see "NVIDIA Control Panel" or "NVIDIA Display" in the pop-up window, you have an NVIDIA GPU. • Click on "NVIDIA Control Panel" or "NVIDIA Display" in the pop-up window. • Look at "Graphics Card Information". • You will see the name of your NVIDIA GPU. • Click on "Apple Menu". • Click on "About this Mac". • Click on "More Info". • Select "Graphics/Displays" under Contents list. WinX HD Video Converter is famous for super fast speed in transcoding 8K/4K/HD/SD MP4, MKV, AVI, MOV, H.264, H.265 and other videos, owing to a broad set of cutting-edge acceleration technologies such as Intel QSV and NVIDIA NVENC/CUDA. In addition, it allows you to edit videos (i.e. trim, merge), tweak parameters, reduce file size, download videos or songs from 300+ sites for free, make photo slideshows with favorite background music, and record videos on/before Mac screen.